Classic Grilles decorative wall grilles are made in the US and all by hand. These round air vents come in a Renaissance design and created with a sand cast, making a unique product just for you! Our decorative wall grilles can also be used in your ceiling and are made out of a solid aluminum. 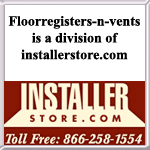 Do not use these round air vents in your floors because of this. The aluminum decorative wall grilles are offered in painted white, brown or black. Get the round air vents in bare aluminum for a classic chrome touch and safely mount in your bathroom since they will not rust. All of the decorative wall grilles come with screws and pre drilled holes for easy installation in your home. Each of the round air vents are also equipped with a screen backing to help hide the sight of your duct opening. The decorative wall grilles faceplate is 1/4" thick to give them an old style look and feel. 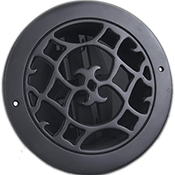 Get your Renaissance round air vents shipped straight to your door for one low cost. Tip: When ordering the decorative wall grilles, make sure to measure your duct opening and select appropriate size which is listed above. The 12" round air vents will fit over a hole that size. An additional 2 inches will be added to the faceplate to provide room for installation. Please note each of the decorative wall grilles are made by hand so sizing may vary slightly. Important: The Renaissance decorative wall grilles will take between 7 to 9 weeks to be made and shipped. Since the round air vents are made to order, they are considered a non returnable, special ordered item that cannot be canceled once order is placed. These decorative wall grilles can also be purchased as round air vent registers which have an all steel adjustable damper. To find other Classic Grilles air returns, browse the other designs listed on our site. Create a timeless look with round air vents which are made just for your home and family. Order these today!